Part Number WE09X20441 replaces: 3290413, WE09M0015, WE9M15, WE9M30. This is a duct felt seal for a dryer. The duct felt seal allows the front-load dryer drum to glide smoothly on the front panel. Your dryer will not function properly if the drum felt seal is compromised. Disconnect power to the dryer before completing this repair. You will need to remove the front of the dryer to gain access to the felt seal. This felt seal may differ in appearance from your original but will function the same as your original. This is an OEM replacement part that is sourced directly from the authentic manufacturer. Hi Nancy, we do not recommend running the dryer without the felt seal. This could potentially damage your dryer as well as the clothing in it. I hope this helps. Hi Raymond, Thank you for the question. The Duct Felt Seal only cover the bottom half. The front drum bearing and the 4 slides that attach to it act as the top seal. Hope this helps! I have some felt like material peeking out of my dryer and I think this is what it is. Since it started falling out my dryer has been making weird noises that are loud and sound like the drum is grinding against the machine. This is frustrating me and I really want to fix it, is this the part I need and will it stop the noise? Hello Denver, you need to remove the drum from your dryer and replace the drum seal, that should stop the noises. To confirm if this part is what you need, we require your model number. Please let us know if you have any further questions. My husband has replaced this part but it keeps coming out. Is there a trick to getting it to stay? It's come out twice now since he's replaced it. Hello Robin, thank you for your inquiry. The felt seal doesn't come with and adhesive to glue the part into place, per our video on PartSelect. It shouldn't require it. However, if this is continuing to happen, I would suggest getting some high heat resistance adhesive and gluing a small part of the felt to the unit in a couple of places. Do not glue the whole thing into place though. I hope this helps! Hi Isabel, below the drum support is where you will find the lower front seal. It needs to be installed on the front panel of the unit. Best of luck with this repair. Hi John, Thank you for your inquiry. If your dryer is making noise, there are some parts that you will need to check to see which one is causing the issue. You will need to check both the green and white drum bearing slides, the front drum bearing, the duct felt seal, the rear drum bearing kit and the drive belt. I hope this helps. Thank you and have a great day! Hi Wayne, Thank you for the question. The Duct Felt Seal prevent the drum from hitting/rubbing but only on the bottom.For the top you will need the, Front Drum Bearing,Part Number: PS960316 and two of the Drum Bearing Slide - Green,Part Number: PS6447706 and two of the Drum Bearing Slide - White, Part Number: PS755842. Hope this helps! Clothing is getting stuck on top of drum, tearing clothes and leaving black marks. What do I need to repair it? Hi Nicki, Thank you for the question. If the clothes are getting stuck on the top, front of the drum I suggest replacing the Front Drum Bearing and the 4 Sides that slip onto the top of the bearing. The bearing may be cracked or chipped and causing the clothes to catch. Hope this helps! My dryer is a year and 3 months old, but it has stop heating. Any ideas as to what the problem could be? Hello Eric, thank you for your question. The most common cause if a dryer not heating is a thermostat. We recommend testing the thermostats in the unit for continuity to see if you can narrow down the issue. THERMOSTAT Part Number: PS12171108 is located on the blower wheel housing in the unit. 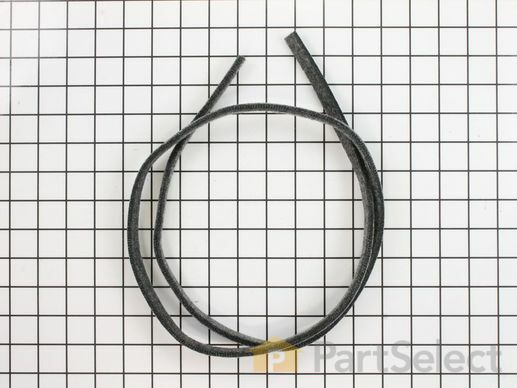 THERMOSTAT Part Number: PS11759043, THERMOSTAT Part Number: PS11772030, and HIGH LIMIT THERMOSTAT Part Number: PS12073908 are all located around the edge of the heating element. I would recommend testing these parts first, to see if they are the issue. If they are all tested and are functioning correctly, the element itself might be the issue. I hope this helps! After replacing the felt seal, while putting the unit back together, the drum became dislodged from the rear of the unit. Reseated the drum shaft, put the unit back together, not the unit won't start (powers up, but won't run after pushing the start button).What am i missing? thanks. Hi John, Thank you for your question. If the dryer is not starting, there are some parts that you will need to check to see which ones are causing the issue. You will need to check the rotary start switch, the interlock switch, the drive belt, the door switch, the drive motor, the idler pulley, the timer, the rear drum bearing and the duct felt seal. I hope this helps. Thank you and have a great day! Delivery came as expected , 5-7 business days. Fits perfect, and dryer works great. Great part, worked perfect, back to running. Parts fit as advertised. Videos hepled. Fast delivery. Thank! My dryer was leaving dark marks on clothes, and a piece of felt was sticking out. I tucked it back in not knowing what it was. My spouse ended up pulling the felt out later. Found the new felt very easily on the website along with a video describing how to execute the repair. It was very easy! The one thing I wish had been clearly suggested (maybe it was) is to replace the four plastic bearings at the same time. got the part that was needed,at a good price and at a good delivery time as needed. Part arrived very fast and after installing dryer was quiet as if it was brand new.?????? The felt pad on my dryer had worn down so bad that the drum was scraping along one of the sides. The new one came in and now my dryer is good as new, the part was the right size and easy to install.